What comes as standard on your 4x4 is ultimately a compromise and can be vastly improved. 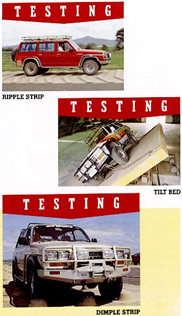 Over the years we have selected from the best components available to improve the ride of your 4x4. Whether you are using it for general off-roading, competitions, expeditions, towing or just want it handle that bit better. Discuss your needs with us and we can be advise on the best package to suit you. "Sagging suspension, a harsh ride and uncomfortable ride on road and lack of wheel travel off road are just some of the problems which are experienced by four wheel drivers with standard suspension systems. 4WD vehicle manufactures are often forced to compromise on their suspension designs because their vehicles have to cater to a very wide customer base. From city driving and general family use to the extremes of off road and heavy load carrying applications of mining companies, standard suspension just cannot cope with all the needs of these individual applications. Old Man Emu suspension are designed, tested and built in Australia. Four wheel drivers everywhere should expect a system which will provide the load carrying requirements for work; increased wheel travel for use off road; and ride suppleness to eliminate the harshness of dirt track washboard roads, choppy city streets and freeway hop. Old Man Emu suspension systems are built to do just that." Applications: Suitable when a mild lift is required (approx. 50mm) or for 4x4's used for towing, load carring and touring. Offers a far superior ride to standard suspension. 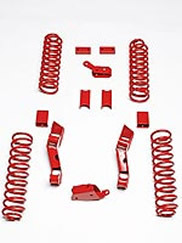 Complete kits available, including springs and shocks, for most makes and models of 4x4. We've found the Old Man Emu kit an excellent solution to the problem of 'sagging' rear ends on Jeep Cherokee XJ's. "At TeraFlex it is all about back country trails, canyon river beds, and dry waterfall ledges. We love the same adventure that you do on the rocks, in the sand, mud, snow, and ice. This passion pushes us to manufacture the best product available for the entire Jeep® family." Applications: Suitable for most models of Jeep, when a lift of 3" or more is required, these systems are designed for the US market and cover applications from trail riding to rock crawling. The choice of many of our Jeep TJ and YJ customers for general off-roading and events through-out Europe. PLEASE NOTE: These systems have to be re-engineered by us to suit the UK right hand drive market and are not available direct from the manufacturer in this form. "Established in the 1950's selling new and used Jeep parts and accessories. It also engineered custom 4x4 vehicles for enthusiasts. In 1990, Rancho developed the first five-way adjustable shock absorber, allowing drivers to adjust the level of compression/rebound damping to suit road conditions, and launches the first "intelligent" shock, the RSX shock absorber. Rancho continues to grow and add fully engineered, industry-leading shock absorbers and suspension systems to one of the world's most recognizable and technologically leading brands. Rancho suspension systems, shock absorbers, accessories and other related products deliver rugged performance for work and play in any on- or off-road environment." Applications: Rancho products suit many makes and models of 4x4's although their suspension systems are primarily aimed at the US market. "Driving a vehicle equipped with Bilstein Gas Pressure Shock Absorbers is an exhilarating experience. There is, quite literally, nothing like it. Unbelievable control and stability. Precise handling. Ultimate performance. And incredible comfort. Since our inception over 40 years ago, Bilstein has been a unique and driving force in the automotive suspension industry. Bilstein was first to apply the patented gas pressure principle to controlling ride characteristics on automobiles and introduced the world's first monotube gas pressure shock absorber. Today, Bilstein continues to be the leader in monotube gas pressure shock absorber technology. No other shock manufacturer has been able to equal the performance and enhanced ride characteristics of Bilstein. The Bilstein name graces not only monotube gas pressure shock absorbers, but also single and twin tube Macpherson strut style suspensions." Applications: Bilstein shock absorbers are fitted as original equipment by many leading vehicle manufacturers. Old Man Emu suspension, complete kit. Old Man Emu suspension, testing. TERAFLEX Jeep Wrangler JK 4" Suspension Kit. Rancho RS9000 adjustable shock absorber system. 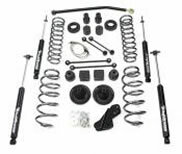 Rancho Jeep Wrangler JK suspension system. 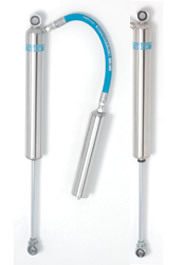 Bilstein 7100 series off-road shock absorber.